When Brooke and Matt stood up in front of their families and friends at Ambrose Family Farm in 2017, it wasn't their first time exchanging vows. After an elopement in 2015, the two decided to host a full-fledged wedding so their nearest and dearest could celebrate their nuptials with them. The two are fairly non-traditional, but they did want to keep a few traditions alive on their wedding day since their trip to the alter had been anything but. 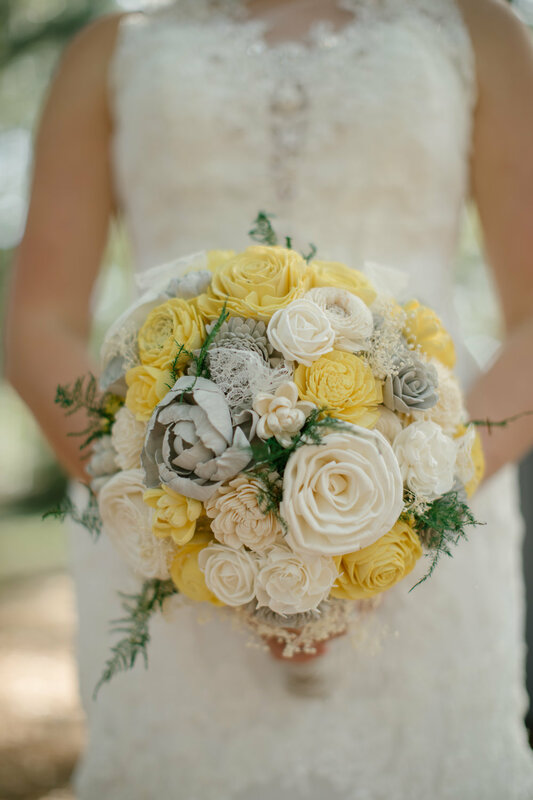 As we love a good mixture of the old and new in our weddings, we knew this wedding from Valerie and Co. Photography was going to win us over as soon as we saw the photos! Read on to see how this couple turned a rural home into an outdoor waterfront wedding that's as charming as it is romantic. The two met while playing Call of Duty: Black Ops 2, a fitting introduction since both have ties to the military. At the time, Brooke was about to leave for Air Force boot camp, while Matt serves in the Navy as a First Class Electrician's Mate onboard an aircraft carrier. While playing the game, Matt and his friends noticed that Brooke's avatar had USAF as her clan tag, and the Navy group started to tease Brooke for her Air Force affiliations. Matt looked past their respective military ties (and the teasing of his friends) to chat with Brooke. "After a few minutes of talking, we found out we only lived 30 minutes from one another and decided to meet up that night to play soccer!" says Brooke. The rest was history and they eloped in 2015. 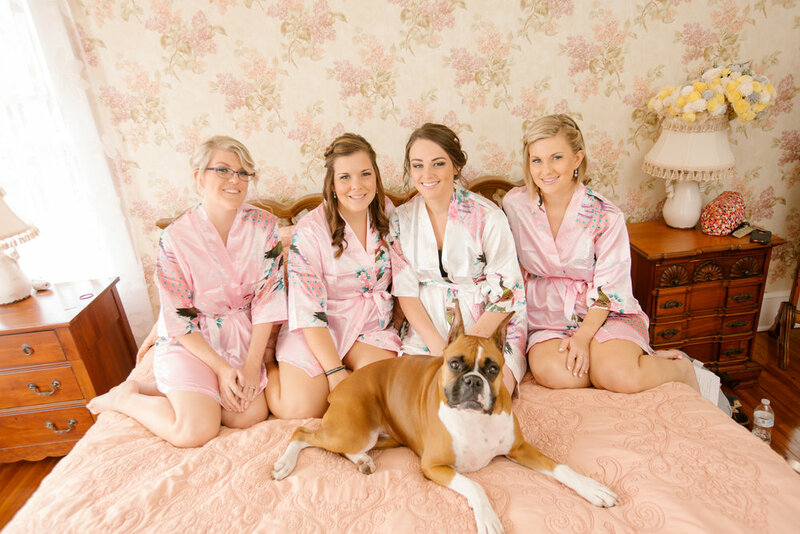 Because of their unique approach to their wedding and their previous elopement, Brooke knew that she was going to incorporate a few typical traditions into her big day. "My gown was kept a surprise which is pretty traditional considering our circumstances," she says. When she was dress shopping, she initially didn't even want to try on the gown that became "The One." States Brooke, "My mother asked me to try it on and I happily did so. We both loved it immediately, probably because it wasn’t a ball gown and it was all lace, we’re both pretty Southern so lace is a must have. Plus, seeing her love the dress I was in made me love it even more!" The beautifully detailed gown was a focus of their first look, which took place on the porch of their friend's farmhouse. The couple loved their traditional moments, but they knew that a first look needed to be included among the day's events. "We loved doing a first look! It allowed us to have alone time before the ceremony… although I think it took away from his ability to cry seeing me walk down the aisle," jokes bride Brooke. 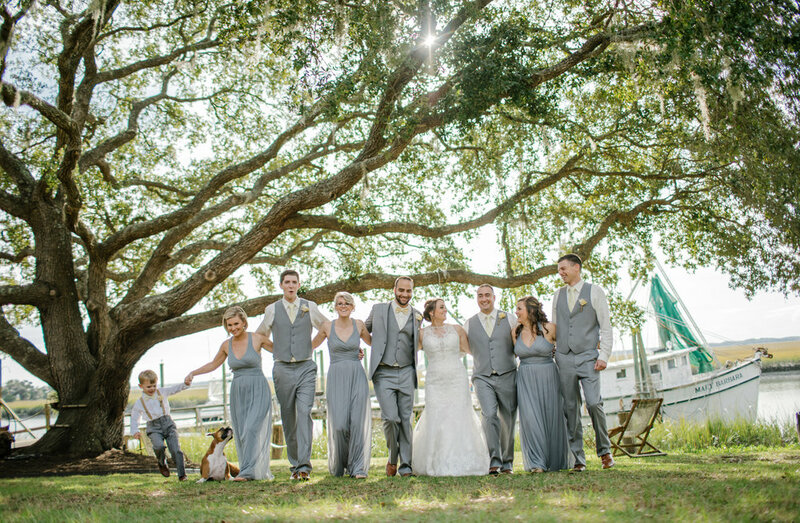 As the couple exchanged vows, they were surrounded by their family and friends in a gorgeous Lowcountry setting. The weather was perfect throughout their ceremony and continued into their nighttime reception. The party at the reception was so much fun for their guests that everyone danced and ate well into the evening. "A lot of people tend to leave early but the majority seemed to hang around for a good bit!" says Brooke. After a garter toss and bouquet throw, the couple thanked their guests for attending and ended the evening with a kiss. It might have taken them 2 years to have a big backyard wedding, but the final result was worth the wait for this couple!